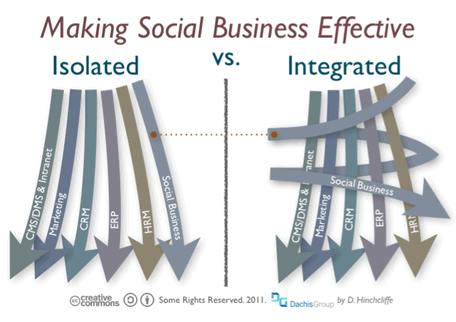 Social Business Software – Solitary Child, Amongst Close Friends or Mr. Popular?? Many companies have by now heard the much vaunted benefits of social business software and want to, or have already started to implement these tools. Studies support this. Forrester Research forecasts that enterprise social software will grow into a US$ 6.4 billion market by 2016. But first some murkiness needs to be cleared. The furor around “social business” is paired with vagueness about what it means. It can mean different things to different people. To a marketer it could mean using popular social media communities like FaceBook and Twitter for promotions (perhaps better called social media marketing). To a support and sales manager it could mean using social tools to improve lead nurturing and customer service (best labeled social CRM?). To a CEO it could refer to the broader business philosophy where social design and technology are used to bring together employees, customers and other stakeholders in a seamless collaborative environment. However, in its most common use, social business refers to the use of social tools — activity streams, social networking, tagging, “following,” status updates, wall messaging, etc. — internally in organizations to spur productivity. This article refers to social business software in that sense. But even here, the path is far from obvious. Vendors bring a broad spectrum of solutions, and everything shipped today seems to come with “social” attached to it — social intranet, social CRM, social project management, social ERP and social collaboration. One approach is to implement social business software as a self-sufficient “enterprise social network” with minimal integration with other corporate applications or processes. Employees are encouraged to participate, connect with colleagues, communicate and share information. However, since there is no linkage with enterprise applications, information is either created within the network, or manually added and shared. The assumption here is — socializing is a goal worth pursuing in itself, and leads to productivity as a byproduct when people are communicating, connecting and sharing freely across the organization. This virtual gathering spot, where people freely and informally exchange information, is expected to unlock trapped organizational knowledge. – “Socialization” is very hard to track and measure and link with organizational objectives. – It is unrealistic to expect employees to spontaneously participate in an enterprise social network to expend social energies. It is more likely that it will become “yet another tool” in an employee’s already overloaded repertoire, and never be used much if not linked with the employee’s job. It is for this reason that many enterprise networking initiatives have adoption issues. Forrester recently found that despite significant investment in enterprise social technologies, adoption levels are only at 12% within the overall workforce. – Companies seem to want more from their social tools. A recent study by Harris Interactive for Microsoft found that 59% of decision makers think the enterprise social network must be integrated with existing investments/ infrastructures, while 66% called integration into existing systems a concern. Communication and collaborations tools may be seen as the “natural home” for social business tools. Rather than seeing socialization as an end in itself, even business owners see social business software as a vehicle for communication and collaboration. The Harris Interactive study found that 64% of decision makers cited driving greater collaboration and productivity in the organization as a reason for implementing social business software. Social tools integrated with traditional collaboration tools results in a synergistic, symbiotic relationship with all around benefit. The focus of social tools shifts to task completion, which is a measurable, tangible organizational outcome. Employees are also more likely to put the new tools to use because they are now part of their workflow. 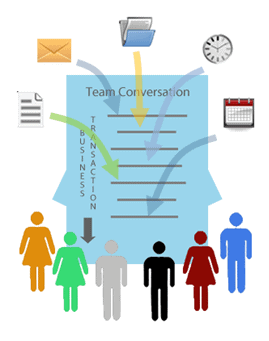 Collaboration tools benefit as social tools help optimally manage information flows that arise from natural collaboration activities — coordinating meetings, discussing an issue, working together on documents, coordinating a project. Activity streams are a vastly more efficient tool for consuming this information than email. Social tools actually spur information flows, because of their natural conversational environment where employees can undertake structured collaborative tasks. Social tools also help combat the tendency of traditional collaboration software to create mini silos (workspaces, folders, etc.). “Collaboration across silos” was one of the top benefits reported by users of social software in McKinsey’s latest Web 2.0 results survey. The third, most radical view is to think of social software as the center of all information flows in the organization and employees’ primary way of consuming enterprise information. Social tools are linked to all major enterprise applications like ERP, CRM, messaging, collaboration, billing accounting, through APIs/connectors and all changes are pushed to employees social walls. Social tools are the software of choice for workers and a gateway to all other applications. Vendors like Podio encourage this approach with app marketplaces, where a wide selection of apps can be plugged on top of their social layer. This approach puts tremendous confidence in the power of social business as a means of organizing enterprise information. Thought leaders like Dion Hinchcliffe have also evangelized this approach. Organizations like these may be seen as “social centric organizations” that have a deep belief in the positive and transformational effects of social technologies. Today, the best entry point of social tools in businesses seems to be together with its “group of close friends.” Communication, collaboration and social tools have a natural affinity which brings businesses the value of socializing, but makes it subordinate to task completion. Social software as a lonely child is unlikely to be of much benefit. It might spur some information exchange, but since this is disconnected from enterprise information, it is unlikely to be of much value. Social software as Mr. Popular might well be the way of the future, but organizations would much rather prefer to wait and watch to see concrete examples of success before taking this approach. The final utopia of social business software might well be software which seamlessly binds all information flows not just within the organization, but even outside. But that is yet to be seen.